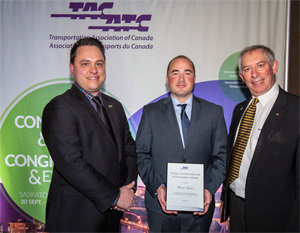 The TAC Young Transportation Professional Award recognizes an employee of a TAC member organization who has demonstrated outstanding accomplishments as a young professional in the transportation industry. Nominees must be no older than 35 as of December 31 in the year the award is presented. A representative of any TAC organizational member may nominate a colleague by submitting a nomination form by February 8, 2019, accompanied by a nominee profile. The profile should describe how the nominee meets the criteria described below, using specific examples. Self-nominations will not be accepted. A selection committee comprised of TAC's council chairs evaluates all submissions and recommends the most suitable nominee, to be ratified by the Board of Directors. Nominees will be judged according to the criteria described below. The selection committee will rank candidates based on weighted criteria. The selection committee reserves the right to modify the criteria, or to not recommend a nominee in any given year. The winner will be contacted by May of the year in which the award will be conferred. The award will be presented at the annual TAC Conference and Exhibition, and will include a travel stipend of up to $2,000 to offset the costs of attending the conference.